When the Indians of the northern pueblos of New Mexico revolted against the Spaniards in 1680, the Spaniards and many Indians fled down the Rio Grande to the present-day Juarez area. Four communities were established in the region for the refugees, one of them being the settlement of Socorro, founded in 1680, and was home to Piro, Tano and Jemez Indians as well as the Spaniards. Some research indicates that the first Socorro Mission could have been built as early as 1683, but other records indicate it was completed in 1691. Raging floodwaters swept the first church away in 1740. Its successor, built of adobe, served the community until 1829 when a massive flood again struck the valley and washed it away. This earlier mission site is approximately one-half mile south of the present-day Socorro Mission. The nave of today’s mission, Las Purisima Concepcion, constructed between 1829 and 1840, was formally dedicated in 1843 and is listed in the National Register of Historic Places. It is built directly on the ground and made entirely of adobe. It is thought that some of the decorated vigas in the nave were salvaged from the earlier mission after a flood. The walls of the structure are 5’ thick at the base, the main nave measures 22 by 100 feet, and the ceiling is 26 feet high. In 1847 the bell tower was added and the east and west sacristies were added sometime after 1880. Between 1923 and 1936 the exterior was covered with Portland cement, causing moisture entrapment which is damaging to the walls. As a result, the east nave transept wall was beginning to fail. Other causes of deterioration were inadequate site drainage, removal of interior structural and architectural braces, deteriorated mortar joints and inadequate maintenance. 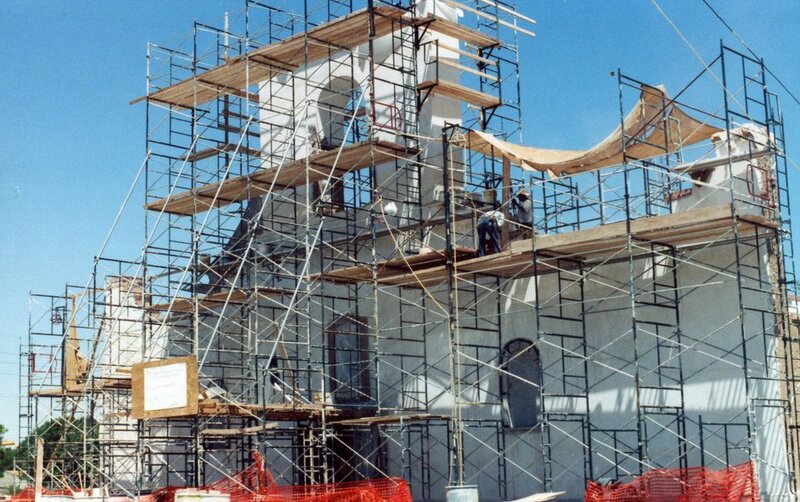 In October 1998, Cornerstones was invited by La Purisima Restoration Committee to lead the restoration of La Purisima. Funding in 1999 from the Texas State Historic Preservation Commission supported archaeological investigations, preparation for the foundation work at the wall bases, removal of the flooring system, removal of interior cement slabs, and installation of shoring and scaffolding to support the roof. With generous funding from Houston Endowment and the Texas Workforce Commission in 2001, twenty full-time paid jobs were filled, with each job allotted a total of 1,000 training hours. Also in 2001, grant funding permitted preparation of the Historic Structures Report and Preservation Plan which was completed in March 2002. From the outset, it was Cornerstones’ intention to establish a program for hands-on training, particularly for at-risk youth from the Socorro area. In early 2000, using funding from the State of Texas, youth interns from K.E.Y.S. Academy in Socorro participated in the training program and they became an important part of the workforce. They, along with instructors and volunteers, were responsible for making some 12,000 adobes used during the restoration process. Cornerstones also offered paid internships through the International Council on Monuments and Sites (ICOMOS) for the services of student archaeologists and architects. Young trainees from Ecuador, South Africa, Australia, Mexico and Ghana received valuable hands-on training during their three-month internships. From 2000 through the fall of 2004, restoration efforts continued almost without interruption. During those years, the cement plaster that covered the structure was removed, the walls were repaired or rebuilt, mud plastered and resurfaced with lime plaster; the interior walls were repaired and refinished with gypsum. There were extensive basal repairs and the cement collar was removed and replaced with adobe. Vigas, corbels, lintels and bond beams were documented, repaired or replaced. The entire floor was removed and replaced with beautiful stone donated and installed by a stonemason and his family from Texas. The roof was repaired and parapets were restored. The bell tower was stabilized and the bell reset in August 2005, and Nuestra Señora de la Limpia Concepción was rededicated in September of that year.